Even in the strongest of relationships, negotiations can get tricky. That’s why we’ve made it our mission to find the common ground between carriers and shippers, always endeavoring to find a ‘win-win’ outcome that’s mutually beneficial to both. Terry began his career in the transportation industry in 1987, working as a dispatcher with a small freight brokerage firm in Atlanta, Georgia. After working his way through the ranks and into sales, he found his true calling in contract and freight lane negotiations. 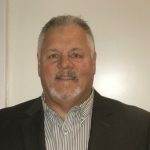 In the early 90’s, Terry moved into a new role with a larger asset-based carrier, where he developed a deep knowledge of all operational and sales-related aspects of supply chain networks. He also forged relationships with a diverse range of shippers, securing ongoing national contracts in the years that followed. Throughout his career, Terry has directed the negotiation of transportation contracts with large national accounts, including corporations who have today grown into household names. Terry’s dedication to customer service, paired with a creative attention to detail, are the cornerstones of a career that has spanned more than 20 years. Terry and his family still call Atlanta home. You can often find Terry riding his Harley Davidson across the Southeastern back roads or hitting the fairways of the many golf courses across the Metro Atlanta area.